A roasting pan or baking dish partially filled with water to allow food to cook more slowly and be protected from direct high heat. Used for custards and terrines. Creamy pudding that is made with cream and eggs, then set with gelatin. Fritters. Small dollops of dough that are fried. Butter and flour mixed together in equal parts and used to thicken liquids. 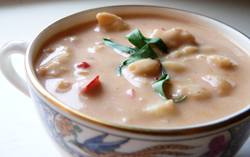 A shellfish soup that has been thickened. A stew made from meat that has not been browned or fried. 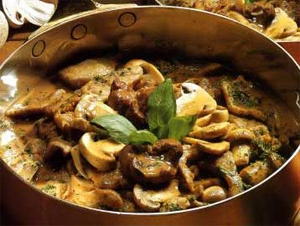 Usually refers to stews made of lamb, chicken or veal. A mixture of fresh herbs tied together with string and used to flavor stews, soups etc. It refers to a mix of parsley, bay leaf, thyme (and sometimes celery stalk). The bouquet is removed before serving. Vegetables cut into very small diced pieces. An appetizer consisting of a small bread or biscuit base covered with a flavored topping. To remove the backbone from a rack of ribs. Broth that has been made clear. 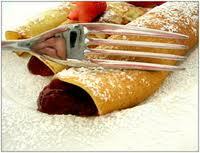 A thick sauce usually made from one main ingredient, such as raspberry coulis. Flavored liquid used for cooking fish. Bread piece dipped in butter and baked until it is crisp. Crust. Sometimes refers to a pastry crust, sometimes to toasted or fried bread. Small cubes of bread used as a garnish is salads and soups. Small mold shaped like a castle used for molding salads or baking cakes. To deglaze, to loosen browned juices and fat from the bottom of a frying pan or saucepan by adding liquid, bringing to a boil and stirring. The liquid is usually water, wine or broth. To extract juices from meat, fish or vegetables, usually by salting them, then soaking or washing. It is usually done to remove a strong taste. To skim off the scum that accumulates at the top of a stock or sauce. Finely chopped raw mushrooms, used as a stuffing. Sometimes combined with chopped ham or scallops. The term used to refer to something served before the main course but is used now to refer to the actual main course. Dessert or sweet, but not including pastries. A thin slice of meat that is often pounded out to make it thinner. To set alcohol on fire. Something that is iced or set on or in a bed of ice. A stew made from poultry, meat or rabbit that has a white sauce. Reduced brown stock used to add color and flavor to sauces. To sprinkle the surface of a cooked food with bread crumbs and butter, and sometimes cheese and brown under the broiler. The finished food is referred to as au gratin as in au gratin potatoes. The juices that occur naturally from cooking. Small diced mixed vegetables, usually containing at least one root vegetable. Sometimes also means a mixture of fruit, like fruit salad. French word for a covered earthenware container for soup. The soup is both cooked and served in it. 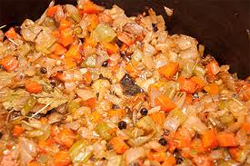 A mixture of braising vegetables. To hand meat, game or poultry. A cake tin that is wider at the base than at the top and only about 1" in depth. To coat, mask or cover with something. The word literally means "nut". It usually means nut brown in color. For example, beurre noisette is butter browned over heat until it becomes a nut brown color. It can also refer to boneless rack of lamb that is rolled, tied and cut into rounds. The word can also refer to hazelnuts. 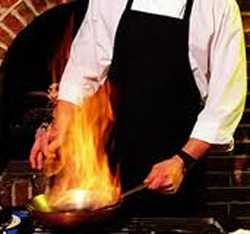 A term that refers to the style of cooking that features lighter dishes with lighter sauces and very fresh ingredients. 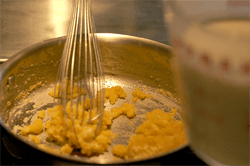 A very thick mixture, usually made from a combination of flour, butter and milk, that is used as a base for dishes such as soufflés and fish cakes. To coat with egg and crumbs before frying. 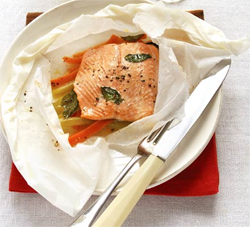 A wrapping of parchment paper around fish or meat used for cooking. The paper retains moisture in the food. Refers to potatoes molded into balls with a melon scoop and fried or roasted. A basic mixture or paste. Often refers to uncooked dough or pastry. A paste made of liver, pork or game. A sweet or pastry, it also refers to a cake shop. To insert fat, bacon, ham etc into meat or poultry. Minced fish or meat mixture that is formed into small shapes and poached. It also refers to a shape that the minced mixture is made into. Flour mixed with water or egg white and used to seal pans when cooking food slowly. 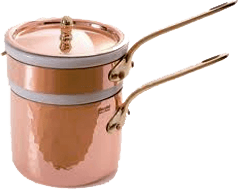 Often used when cooking a ragoût. To quickly fry meats or vegetables in hot fat to warm them through. Melted butter to which flour has been added. Used as a thickener for sauces or soups. Garlic and oil emulsion used as flavoring. A deep frying pan with a lid, used for recipes that require fast frying, then slow cooking. Pâté or mixture of minced ingredients, baked or steamed in a loaf shaped container. A dish cooked in a mold that is higher than it is wide and has sloping sides. A type of sauce made from butter, flour, cream and stock. 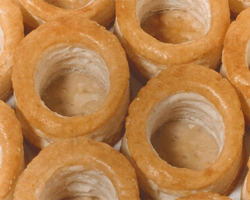 A large pastry case made of puff pastry that is usually used as a container for creamed dishes, such as creamed chicken.